Dogs- The Best Way To Improve Your Health! “Dogs fill up our homes with filth and are an invitation to diseases. We should never consider having one!” If you hear any of the above opinions, from now on, you will have all the reasons to defend yourselves on the issue of whether dogs are healthy to keep as pets or not. Believe it or not, there are many benefits of having a dog as your pet. 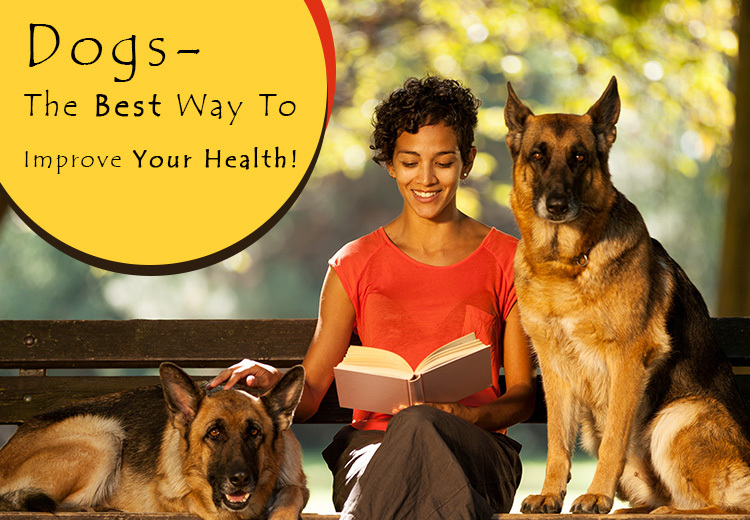 Several researches have proved that dogs can be a catalyst to improve your health. They have a natural tendency to improve our health. You must be wondering that how these pawed friends of ours can have an impact on our health. Isn’t it? Well, let’s have a look on the health benefits of these balls of fur! They help you be in a better shape! If you are the one who does not enjoy exercise or gym sessions then having a pet dog will make exercise absolute fun for you. Let see how! A dog needs at least 20 minutes of walk twice a day. You can take your dog for that stroll and shed your own pounds too with this companion. Dogs are fun outdoors! You can play fetch at a nearby park or just let him chase you. It is an easy and a lovable way to be in a better shape and much better than those lifeless equipments. So, your dog would be the key to your fitness. Dogs can be a better medium for making friends than social media! We have often seen pet parents communicate silently when they come for a walk at any park. When you take your dog to any park, he may develop a bond with other tykes. Let them be on their own. When this happens, it is obvious that their human parents will also get to know each other. Who knows where does this “knowing” lead to? May be they can be just friends or best friends or even much more. You might have heard about love stories that blossom in a dog park. Who knows one day, you too can find a soul mate because of your furry little pet. Their love potion has better healing capacities! Imagine that you are sick and your friends have come to visit you. Nothing would be better! Half of your sickness will evaporate just like that. But, who can be a better friend than a dog? So, eventually who else can help in improving your health better than a dog? Do you know? Dogs always get an instinct when their pet parents are sick. Notice if possible, they will lick you more often when you will feel low or sick. Their love will make you feel so much better and aid in faster recovery. They have the warmest heart in the entire world. Get close to it and watch the miracles happen! Dogs can keep your heart healthy! Statistics have shown that people having dogs have better cardiovascular activities than those who don’t have dogs. Somehow these pawed pals help us in maintaining our cholesterol, blood pressure and triglyceride levels. It has been observed that chances of cardiac arrest reduce by a huge margin if you have a dog as a pet. How interesting! The wall of immunity gets higher! When you have a pet at home, vacuum cleaners and lint rollers are stocked up nicely. A clean home is bound to get disturbed more often by the presence of pets. But, when children come in contact of dogs at an early age, they develop an immunity level against germs and allergens. They are less likely to develop asthma, eczema and allergies caused by dust. This way, dogs makes us healthier and fitter. In all, dogs are the cutest rescuers and can improve your health like no one else can. Their sheer presence makes you joyful. So, if you have been thinking about the idea of pet parenting a dog then execute it now and enjoy a healthy body and a peaceful mind. « Why Do Pet Parents Need to Stock up on Drontal Plus For Dogs?